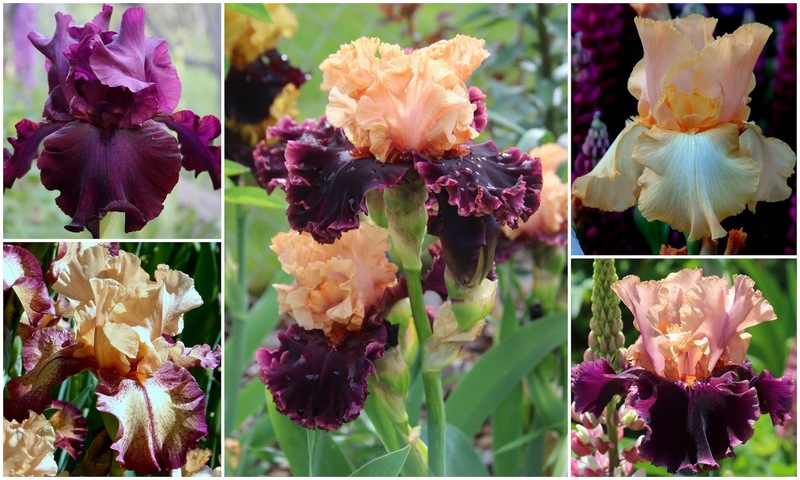 World of Irises: "Talking Irises" - THE 2018 TALL BEARDED IRIS BLOOM SEASON: A SPECTACULAR SHOW! "Talking Irises" - THE 2018 TALL BEARDED IRIS BLOOM SEASON: A SPECTACULAR SHOW! "I have found enduring happiness from the beauty found in the flower garden and from the joy that the love of a garden gives." The 2018 tall bearded iris bloom season, although later than usual, has put on a spectacular show in the top of Utah, zone 6. One complaint, however, is that a week of above normal temperatures reduced the bloom time of the stalks as they sweltered in the heat. 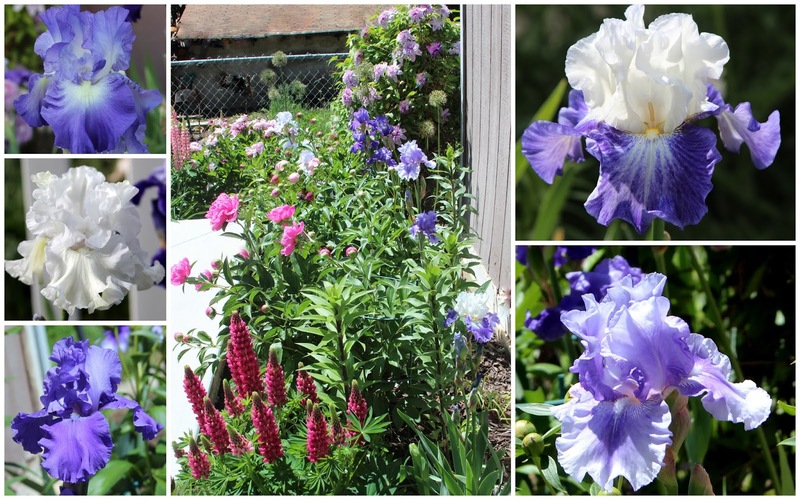 Many later varieties haven't bloomed at the time of this post, but here are a few of my favorites as I took a stroll around the garden beds. 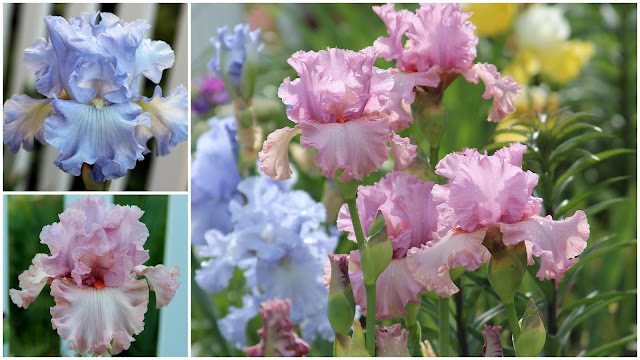 I love these varieties because of their beauty, reliability and their fabulous colors. 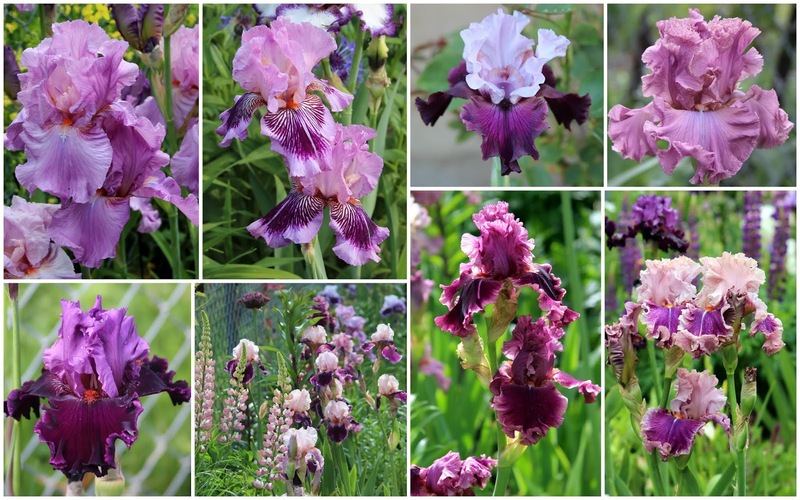 (top l to r) 'PERSIAN BERRY' (Gaulter '77), 'PLUM PRETTY WHISKERS' (Spoon '03), 'PRIVATE EYE' (Johnson '10), 'EYE FOR STYLE' (Blyth '06), 'MING LORD' (Blyth '06), 'QUEEN'S RANSOM' (Van Liere '12), 'ROMANTIC GENTLEMAN' (Blyth '02) 'OXFORD COUNTESS' (Blyth '07) I love this bed--it has some of my all-time favorites! 'LENTEN PRAYER' (Schreiner '98), 'TORONTO' (Johnson '01), 'APHRODISIAC' (Schreiner '86), 'GIGOLO' (Keppel '84), 'NAPLES' (Johnson '01). Color galore--this bed has it! 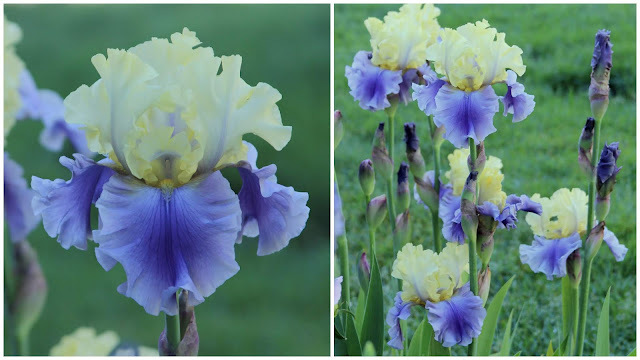 'DAUGHTER OF STARS' (Spoon '01) Always among the top three to bloom--it was the first tall bearded iris to bloom this 2018 season. 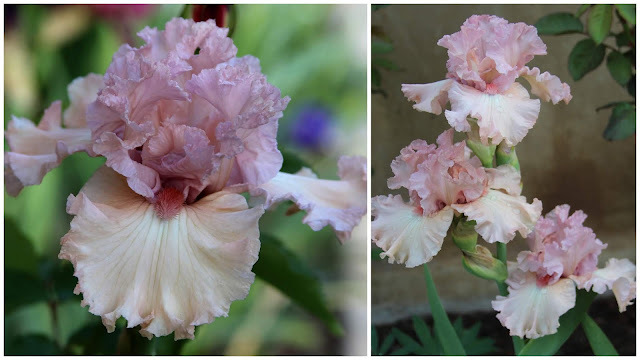 'DARING DECEPTION' (Johnson '12) Stunning--breath taking beauty! 'CENTER ICE' (Ghio '10), 'GITANO' (Keppel '07), 'WINNING EDGE' (Ghio '97). 'PHOTOGENIC' (Ghio '06), 'LOUISA'S SONG' (Blyth '00), 'IN THE MORNING' (Ernst '04), 'LIMERENCE' (Blyth '09), 'MIDNIGHT REVELRY' (Schreiner '05). Outstanding color! 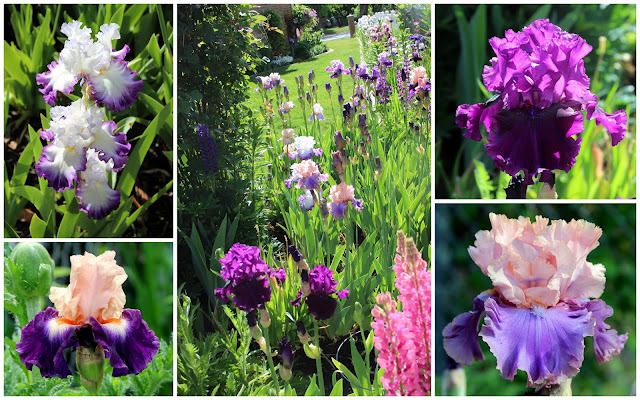 (t l to r) 'CITY LIGHTS' (Dunn '91), 'FOREVER BLOWING BUBBLES' (Ghio '07), 'PLEDGE ALLEGIANCE' (Schreiner '84), 'MILES AHEAD' (Schreiner '10), 'NO COUNT BLUES' (Schreiner '09) A single rhizome of each of these irises were just planted last summer, and I was thrilled that they all bloomed. ME PINK' (VanLiere '11), 'QUEENS CIRCLE' (Kerr '00), 'PROUD TRADITION' (Schreiner '90), 'HEATHERIDGE' (Gatty '85), 'NIGERIAN RASPBERRY' (Kasperek '95), 'SONG OF NORWAY' (Luihn '81), 'CROWNED HEADS' (Keppel '97), 'EVENING TIDINGS' (Schreiner '09), 'ABOVE THE CLOUDS' (Schreiner '01), 'MAGICAL' (Ghio '07), 'RUFFLED BALLET' (Roderick '75), 'SOCIETY PAGE' (Ghio '10). This established bed never disappoints. 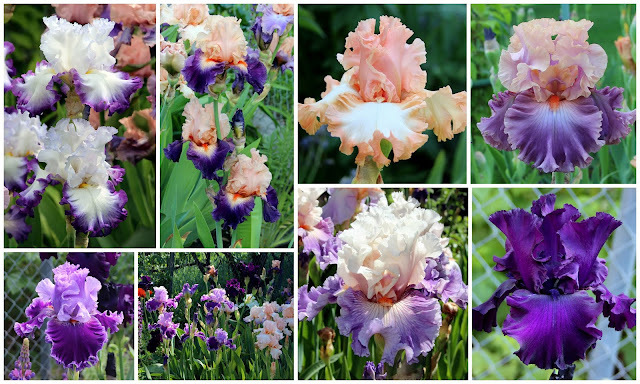 'CENTER ICE' (Ghio '07), 'PURPLE SERENADE' (Schreiner '05), 'GITANO' (Keppel '07), 'LOUISA'S SONG' (Blyth '00) 'FLORENTINE SILK' (Keppel '05). 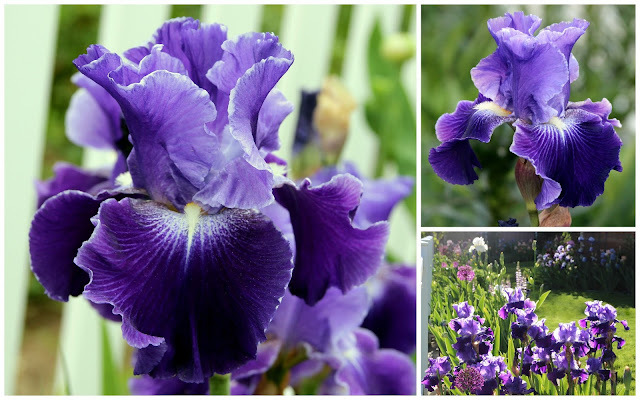 There are many irises still in the bud still to bloom in the coming days. 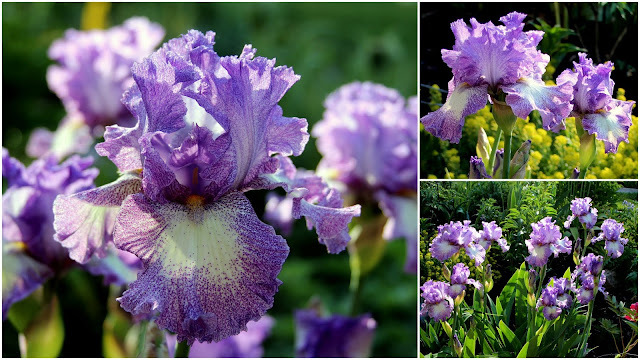 How has your tall bearded iris bloom season been? 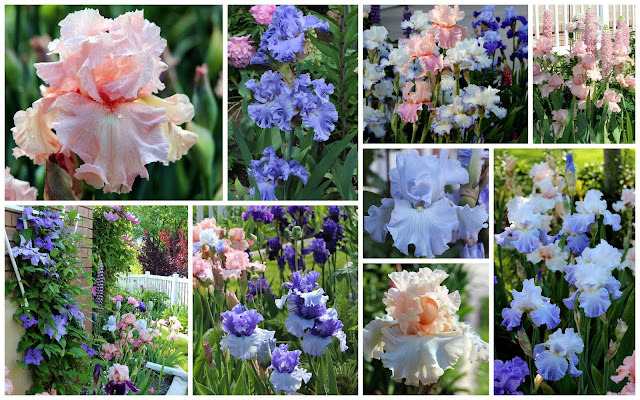 What were your favorite blooms this year? I'd love to hear from you! Your a master gardener Susanne. 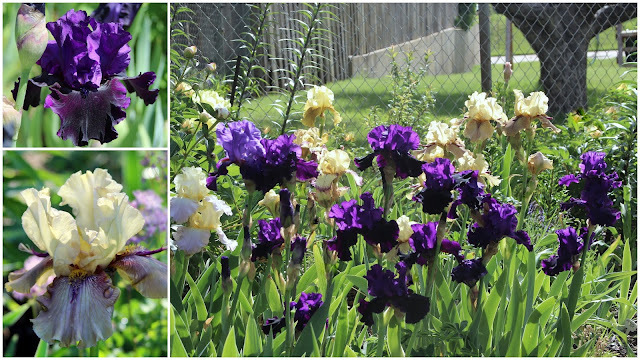 Love your 'moodboards', and your ways of combining irises with other plants. Exquisite! I live in central Alabama. We had a long cold winter for a change, and the iris bloomed their heads off. My favorites this year were Unconditional Love and Royal Sterling. Yes, those those two are a few of my favorites as well--beautiful! Holy cow! It will take me a while to process so much beauty! 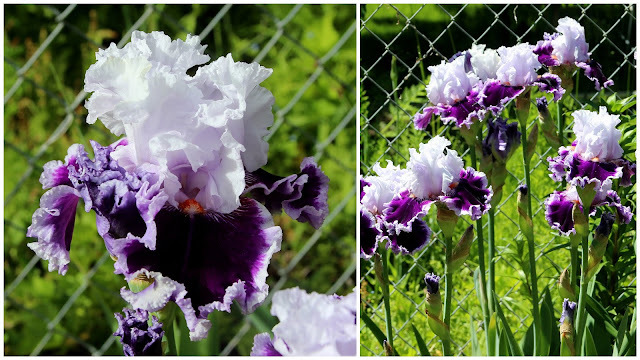 Thank you so much, Renee--I re-visit your pictures often--breathtaking beauty is found in all your beds! Always enjoy to see youtrh garden in bloom. Thank you for sharing! Merry Amigo is one I'll have to look up. I moved Glamazon last year, and it didn't bloom this year. It goes without having to say it that each iris shown is more beautiful than the before and after one, but it was the awesome skill of the photographer who brought all those amazing flowers into their incredible best. Whoever you are, from one photographer to another, I salute you! Thank you very much! I appreciate such kind words. Several first year blooms really stood out for me due to the quantity and quality of their blooms... Persian Berry, Achy Breaky Heart, Social Blush, and Innocent Star. I will look up Achy Breaky Heart and Innocent Star, which I', not familiar with. I always love hearing what others are fond of. Simply beautiful. I can get lost in those photos. I enjoy more than any single iris photo that you have published on your blog, the composite of various perennials together with your irises. I have never seen anything so beautiful before. 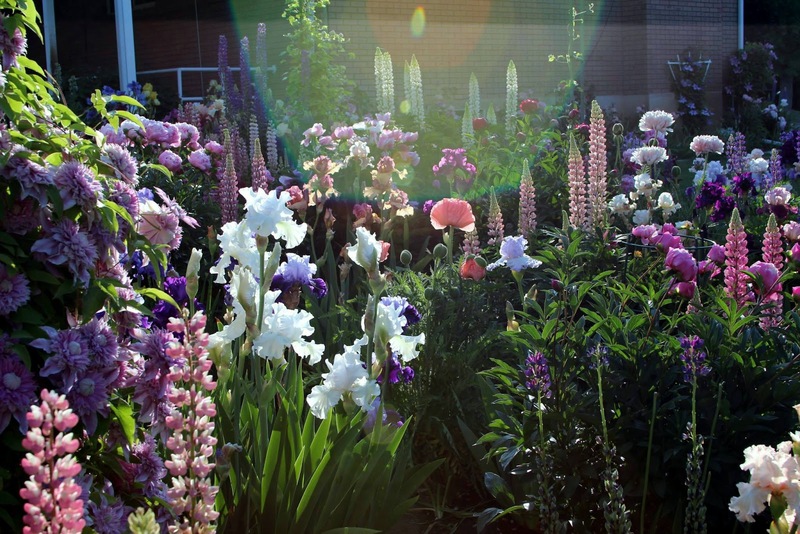 Especially with the lupines and other tall flowers. Thank you so much for sharing with all of us! Can you share with us the names of the other flowers in your mixed beds? Thank you so much! Yes, I will gladly do that. Give me a few days, when I have a minute. Thank you again. Thank you so much. Please, take all the time that you need. Hello again, Evelyn. Some of my favorite perennials that do especially well here in the top of Utah, with its cold and snowy winters besides the lupine, I love using various vines, such as clematis, of course, peonies, both tree peonies and bush peonies, flowering bulbs, poppies, euphorbia, lamium, hosta of all sizes, and lilies are stunning! I use a variety of hybrid tea roses, even though their bloom is just after the iris bloom, they sometimes overlap a bit. I have various ferns, and even though they don't bloom, their fronds look nice with the flowering plants. Since I do floral arrangements for a local dentist's office, I have a baby's breath plant that has been very long-lived and produces beautifully. Daisies of all kinds are easy to take care of--I especially like to use varying heights and colors--I like the painted daises for their color. I hope that helps. If not, let me know. I'd be happy to discuss it further. Good luck!